Be the first to share your favorite memory, photo or story of Jozella. This memorial page is dedicated for family, friends and future generations to celebrate the life of their loved one. 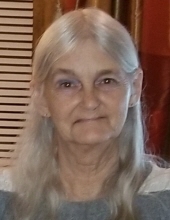 Jozella Beschorner, 66, of West Union, IL, died at 5:05 p.m. (EST) on Monday, February 4, 2019 at the Gibson Family Center for Hospice Care at Union Hospital in Terre Haute, IN. She was born March 27, 1952 in West Union, the daughter of Pat & Bill Cook. Jozella would dedicate much of her life to caring for her home and all who dwelled within it. It was with this caregiver’s heart that brought her to become a CNA, and in this capacity, she worked for Paris Healthcare for a time. Later in life, she became quite an avid Twilight fan, and was also known to binge-watch the Hallmark channel. Friends and neighbors will long remember her swinging on her front porch, enjoying a Pepsi. Though she found happiness in all of this, few things brought her more joy than loving on her cats or babysitting her treasured grandchildren. Faith also played an important role in Jozella’s life, having been a longtime and active member of the West Union Christian Church. We find peace in knowing that her faith has been made sight and that today, she is experiencing paradise. She is survived by her daughters, Tammy (Beschorner) & husband Gary Rogers (Paris, IL), Stephanie (Beschorner) Weaver (Brazil, IN), and Michelle (Beschorner) Arnold (West Union, IL); by her son Shawn & wife Nicki Beschorner (Paris, IL); by her grandchildren, Darian Rogers (St. Marys, GA), Dylan Rogers (Paris, IL), Drew Rogers (Paris, IL), Dawson Rogers (Paris, IL), Bella Rogers (Paris, IL), Skylar Beschorner (Brazil, IN), TJ Weaver (Brazil, IN), Samantha (Zink) & Vernon Smith (Vermilion, IL), Madison Arnold (Altamont, IL), Ethan Shephard (Paris, IL), AJ Beschorner (Paris, IL), Alyssa Beschorner (Paris, IL), and Kyler Beschorner (Paris, IL); by her great-grandchildren, Bryan Smith, Benjamin Smith, and Landon Vester; and by her close friend, Doug Pottorff. She was preceded in death by her parents, Pat & Bill Cook; by her maternal grandparents, Lyman and Zelpha Pritchard; by her paternal grandparents, Russell and Liz Cook; and by her granddaughter, Alecia Arnold. Funeral services will be held at 11:00 a.m. on Monday, February 11th at the West Union Christian Church with Pastor Ken Gillaspy officiating. During the service, there will be an opportunity for family and friends to share their favorite memories of Jozella. Memorials may be made to the “West Union Christian Church”, with envelopes available at the church. The Prust-Hosch Funeral Home in West Union is in charge of arrangements. To send flowers or a remembrance gift to the family of Jozella Beschorner, please visit our Tribute Store. "Email Address" would like to share the life celebration of Jozella Beschorner. Click on the "link" to go to share a favorite memory or leave a condolence message for the family.